Over the past few weeks I've found myself using Posie Tint almost every day. 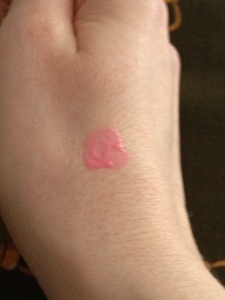 One of Benefit's lip and cheek stains, it's a candy pink colour, liquid formula. Like a lot of the Benefit stains, it comes in a bottle with a brush style applicator. I tend to just use this as a blusher as I find it lasts for hours and looks really natural when blended in to my pink toned skin. The brush applicator means that you have to be very precise about where you want the product to go, however I sometimes apply it to my fingers and blend that way instead. You do need to be pretty quick when blending to avoid a streaky face so I would recommend doing one cheek at a time! My mini bottle of this (that I got with Glamour magazine months ago) is still going strong so I think this is a great value product. The full size is 12.5ml and retails at £24.50. 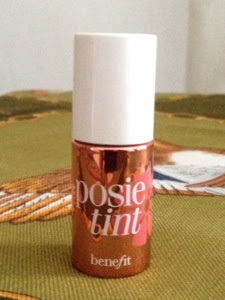 Have you tried Posie Tint before? I have never used it before, but it looks good! Good idea, the small size is perfect for travelling! I'm currently holding a number of giveaways on my blog...maybe you would like to enter?